In late July 2012, museum director/curator Bill Tyre and museum docent John Waters traveled to The Rocks, the Glessners’ former summer estate in the White Mountains of New Hampshire. The estate was an important part of the lives of the Glessners who would spend four to five months there each summer. Their two children, George and Frances, in later years made The Rocks their permanent year-round home. The Glessners selected the location due to its positive effects on George, who found immediate relief from his severe hay fever when first traveling there in 1877. After spending several summers in a large resort hotel, they purchased the first 100 acres of land in September 1882. Within a year their home, known simply as the “Big House” was completed based on a design by Isaac Scott. Scott designed numerous other structures on the estate including a carriage-horse barn, a playhouse for Fanny, an observatory, gardener’s cottage, and a series of summer houses. John Glessner continued to buy surround acreage and eventually the estate grew to incorporate about 1,500 acres of land, much of it purchased to prevent it from being deforested. Glessner was an early conservationist and in 1903 joined the Society for the Protection of New Hampshire Forests. The area closest to the Big House was elaborately landscaped by family friend Frederick Law Olmsted, and was later reworked by his sons, one of whom attended Harvard with George Glessner. Architect Hermann H. von Holst, another family friend, designed several structures on the estate in the early 1900s including The Ledge (a home for George and Alice Glessner), the entrance gates, an enlarged horse barn, a combination sawmill-pigpen, and a cow barn. The Rocks functioned as a thriving farm. John Glessner was especially interested in raising prize winning poultry. His crops won numerous awards at the annual state fair. The farm supplied the family and staff with food not only in New Hampshire, but in their Chicago home as well. Glessner also used the estate as a testing ground for new equipment being developed by Warder Bushnell & Glessner (later International Harvester). In 1977, most of the estate was donated to the Society for the Protection of New Hampshire Forest by two of the Glessner grandchildren, John Glessner Lee and Martha Batchelder. Much of the land has been allowed to return to its natural forested state. The site is open to the public year-round, and various trails cut through the property, including one trail that goes past the various remaining structures from the Glessner period. Nigel Manley has served as director of the estate for 26 years. The operations are supported in large part by the growing of Christmas trees, and the museum acquires its live Fraser fir each year from The Rocks, continuing a tradition begun by the Glessners in the 1880s. For more information, visit http://www.therocks.org/. This view shows the Bee House designed by Isaac Scott for Frances Glessner in 1896. It was elaborated carved by Scott who also added a series of quotes relating to Mrs. Glessner’s interest in beekeeping. In the 1930s, it was remodeled into a pool house, when the Glessners’ daughter-in-law added an in-ground swimming pool. In recent years, it has been faithfully restored to its original design. The Big House would have originally stood just to the left of the Bee House, just up the hill. 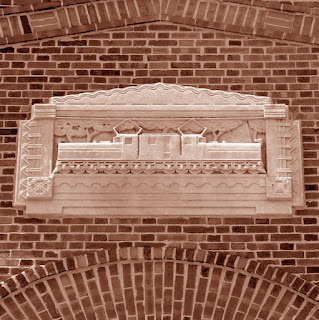 Elaborate carved brackets and fascia in the Bee House by Isaac Scott. Log cabin playhouse, designed by Issac Scott for Fanny Glessner in 1886. Today the house functions as the visitor’s center for The Rocks Estate. Big Rock Summer House, one of several designed by Isaac Scott in the 1880s. It is the only one still standing. This house began as the gardener’s cottage. After the marriage of George Glessner and Alice Hamlin in 1898, it was remodeled and enlarged for their use. After a new house, The Ledge, was built for them, the cottage became the home of Frances and Blewett Lee. By 1938, it became her year-round residence until her death in 1962. It is now owned by the North Country Council. View of the White Mountains from the area behind the cottage. This large flat area was graded and used as a tennis court when Frances Glessner Lee’s children were young. Note the chaise lounge to the right carved from a solid block of granite found on the grounds. A portion of the original terraced gardens designed and installed by Olmsted and his sons. This beautiful combination structure housed a sawmill on the left and a pigpen on the right. It was designed by Hermann V. von Holst in 1906. Today, the building houses an interesting exhibit about the New Hampshire maple industry, showing equipment used to harvest maple syrup. Each year, the museum acquires its Fraser fir from The Rocks. This is the Christmas tree selected to stand in the main hall of the museum for 2012. One of the most beautiful and striking objects in the museum collection is a robust and colorful vase displayed on the music cabinet in the northwest corner of the parlor. The piece is the work of one of the late 19th century’s most innovative ceramic artists, William Frend De Morgan (1839-1917). The large vase, nearly 16 inches tall, features circular lug handles set against a bulbous baluster-shaped body. Masted Medieval vessels under full sail navigate seas filled with jumping fish in green, blue, turquoise, and yellow. An ouroboros, a mythological serpent-like creature who symbolizes the cycle of life by eating its own tail, decorates one of the sails on the ship. 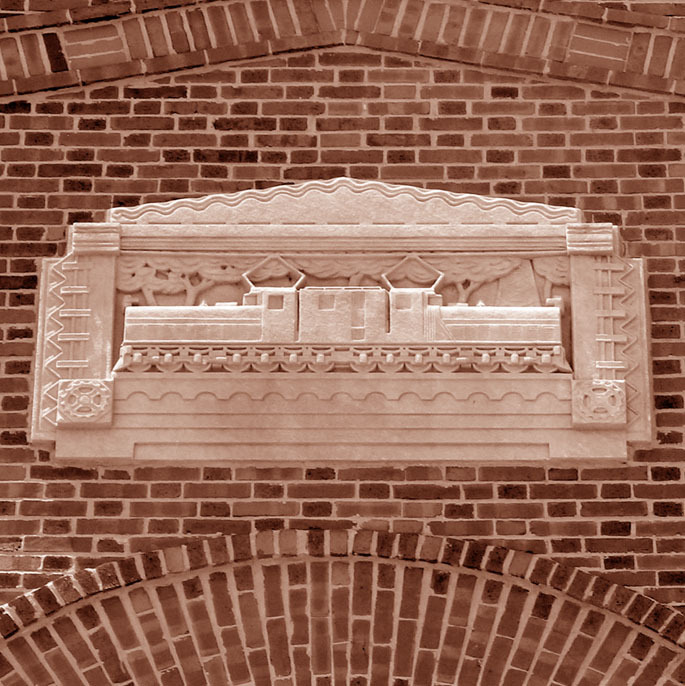 (Interestingly, the same creature can also be found in the carved ornamentation on the front of the house). De Morgan was born in London and enrolled in art at the Academy Schools in 1859. Three years later, he met William Morris, and abandoned painting to join Morris’ team of designers. He executed numerous glass and tiles designs, and painted panels for furniture designed by his associate Philip Webb. While working on stained glass, De Morgan discovered that silver pigments caused an iridescent surface on the glass. His subsequent experiments on tiles to reproduce this effect resulted in the first luster tiles being produced in 1870. In 1872 he opened a pottery works and over the next decade produced some of his finest work, including many pieces based on traditional thirteenth century Islamic pottery from Turkey, Persia, and Syria. His “Persian colours,” as these ceramics came to be known, became the hallmark of his work and the fashion throughout Victorian England. This vase was most likely produced in De Morgan’s ceramic works in Sand’s End, London, and would have been purchased by the Glessners about 1890. Large vases such as this were the most expensive pieces produced, and were painted by De Morgan himself, or under his close supervision. The Glessners owned a number of other pieces by DeMorgan including tiles which decorated the fireplaces in the master bedroom and courtyard bedroom.